Why write minimalist poems, poems using plain language that can be snapped up in a few seconds, and left, the way studies have shown that in an Art museum, the average time spent looking at a painting is about 5 seconds. Let’s consider the following poems from the book Their White with Them (2006, Bondi Studios), by Grant D. Savage. Haiku is a funny thing. The best are simple, just being and seeing, or being and hearing, or being. Being and noticing and not having to say much about it. One of the best facebook posts I’ve received and shared lately says: A wise man once said nothing. Grant’s haiku almost fall into this vein. There is nothing forced about them. He doesn’t explain what he meant to say, or explain the haiku’s hidden metaphors. Usually there aren’t any. In this poem, Grant notices a clear sky, full of calm and ‘nothingness’, notices too a very busy little bee working its striped buns off getting at the pollen in the mint. He leaves us to see the contrast between stillness and busyness, the pure clarity of the sky and the furry body, the stripes and whirring wings, the ‘nosing’ from bud to bud. Subconsciously, or consciously, he was aware of all those things, but he doesn’t tell you ALL that it meant to him, ALL that he noticed, ALL that went through his mind at that moment. The poem is simply the noticing and the noting what is noticed down in a few clear words. A bee buries its face― so simple, but so perfectly descriptive of what is seen. 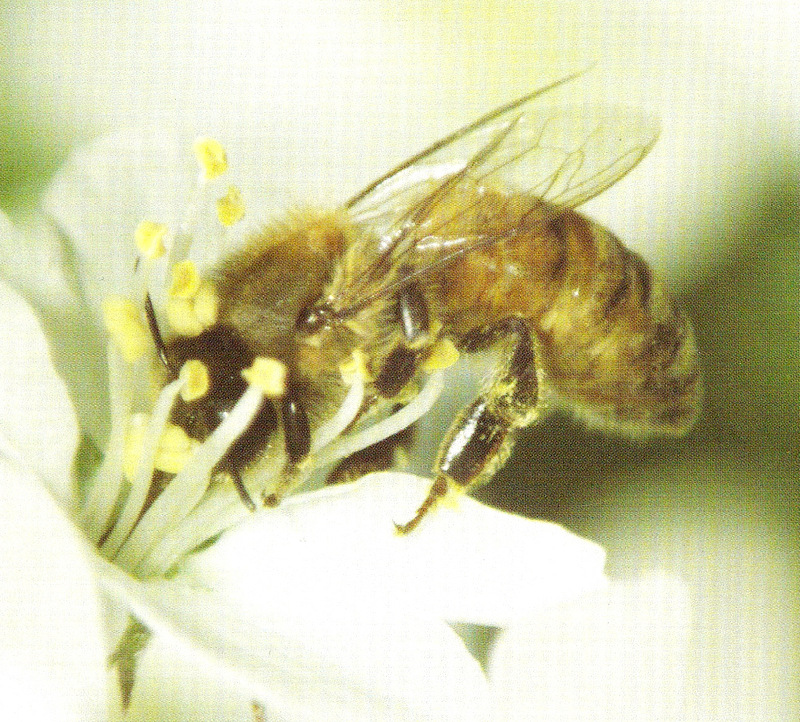 We can’t see the collection of pollen, we do see the body wiggling away to get at the nectar. Grant doesn’t describe the wiggling; that would be redundant as we’ve all seen the movements of a bee collecting pollen, have an image in our minds of what that movement is. A cloudless sky. A bee doing what it does. Simple but precise recording. the rest is up to you. In Grant’s photo above, the bee is not in blue mint, but you can see how closely Grant will look at a bee or any other insect. 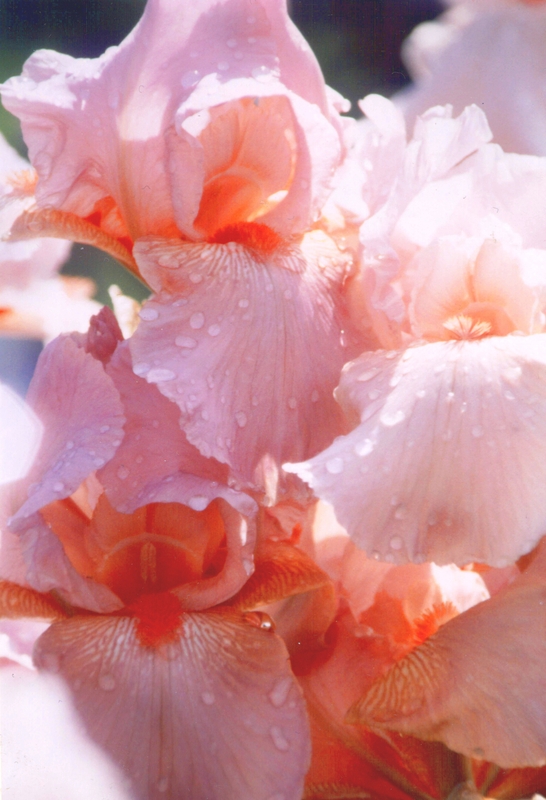 I like the sense of what will come in this haiku, a wordless prediction: the pink iris will open fully, unless, unless. The wording of ‘half open’, can point to the famous ‘half’ saying that we all know: the glass half empty or half full. Too much rain might be the ruin of the iris, but the right amount will allow a perfect opening, a fullness. There is something particularly vulnerable about a pink iris. Iris petals to start with are so fragile looking, and the pink is reminiscent of a dawn sky, a baby’s lips, an awakening. Little girls and big girls and many of the male persuasion are attracted to the colour. I am. Flowers are sexual in nature to start with, but the pink iris touches the woman in me ― the delicate parts of a woman, flaunted in the pink iris. A frustrated bumblebee. A less skilled poet would try to put that word into the haiku, say that it is important to the haiku. The way Grant does it is to ignore what you think you know about how the bee must ‘feel’, or what it is going through mentally, so to speak. He also ignores obvious connections to how we feel in maddening situations; he lets us see the straight funniness of the scene. Give it up bee, it’s not going to work. Neither will we fit into those jeans from ten years ago. The poem also plays with the roundness of the bee’s body, and the rounded parts of the wild orchid. An artist would play with those shapes, as Grant has played with the image in words. A couple of things come together to make this a wonderful haiku. Yes, it is, again, simple noticing, but you have to be in the zone already to notice how certain things complete each other. The word dusk has this feeling, and it’s also a physical feeling in the throat. Say it, and feel the tongue meet the palate for the ‘d’, hear puff of the ‘uh’ in the middle, the sweetness of the ‘s’ and finally the ‘k’ , feel the back of the tongue meet the rear of the palate. The word itself is satisfying to the body. What it doesn’t do is take for granted that North Americans, or anyone, would look for a different (and some would say deeper) meaning given that fleabane is the symbol of exorcism, protection and/or chastity, in the way that Japanese readers of haiku might feel they understand a haiku better if they know all the references a certain word brings to mind. Nor is it important to this poet that its name derives from a belief that this plant repels fleas. We are merely expected to see what Grant sees and experience that with him. Here attention is given not only to a dragonfly, its wings, and its shadow, but the poem points out that even in the shadow of the dragonfly’s wings, there is light. He may be describing notes of brilliance, reflections from water… but whatever kind of light he sees, he leaves it up to you to imagine. The poem is a direct invitation to look beyond surface, to look through to find whatever may be subtly hidden there. Apart from the concrete aspect of the poem, in the progression of its three phrases: in the wings, of the shadow, of a dragonfly, the first preposition leads to a word of one syllable, the second to a word of two, and the third… you see where I am going. Grant may not even have noticed what he has done, he does it so naturally. There is lightness, fragility in the wings in the first line, almost a dance.The ‘sh’ of shadow in the second almost tells the reader to be still. The poem is rounded off with the very solid ‘d’ sound of dragonfly to ground it. I’ve always thought there should be a different word for this ethereal insect. ‘Dragonfly’ has a certain whimsy to it, I admit. But in this poem, that heavy ‘d’ sound is well placed. The poem aurally goes slowly from light words to a ‘heavier’ word. I say slowly, because it seems like this is a slow poem, that Grant sat or stood watching for a while, and eventually went away. Satisfying. 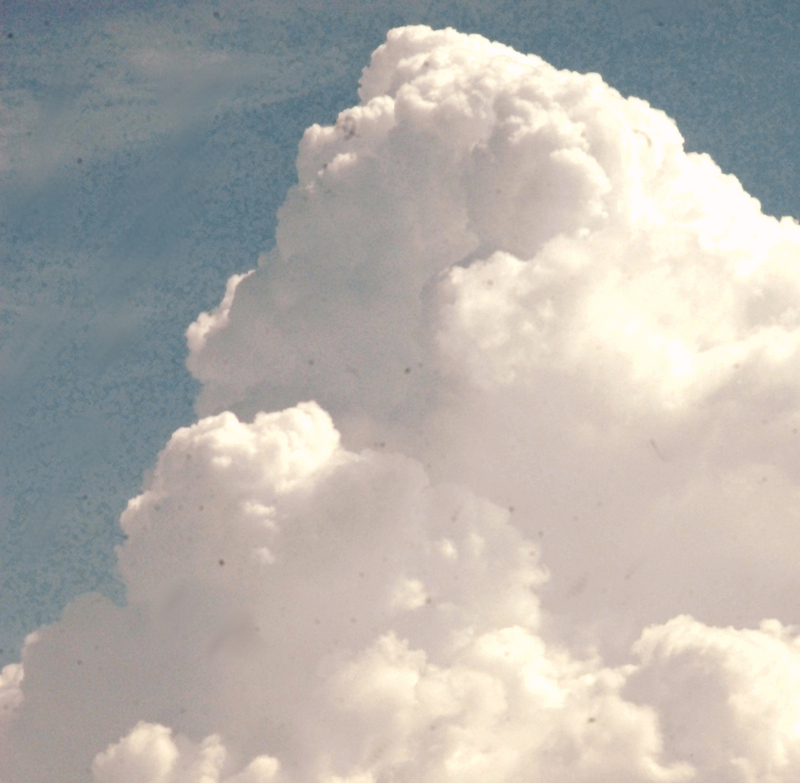 quiet afternoon/ only the silent growth/ of clouds Each part of the haiku points both to the physical aspects of our world/universe and to the self, written by a quiet man ( for the most part) with his quiet views of the world that expand, renovate, and intensify experience. All the photographs in this post are by Grant D. Savage, a man of many talents. Reading Grant’s haiku has made me think about words, and that particular form of poetry, very differently. I am delighted. Then Grant’s work is done! Thank you Audrey!